If you measured a restaurant simply through popularity, then the Alfa Bakehouse in Yarraville would be one of the finest in the land. My wife and I were very lucky to stumble upon a two seater immediately, however despite wall-to-wall, closely packed tables this was the only vacancy. Despite the funky cafe trimmings, the 'Alfa' is not simply a sit down eatery however, with a mass of humanity constantly treading the floorboards between the "Order Here" and "Pick Up Here" signs as they order the take away fare. 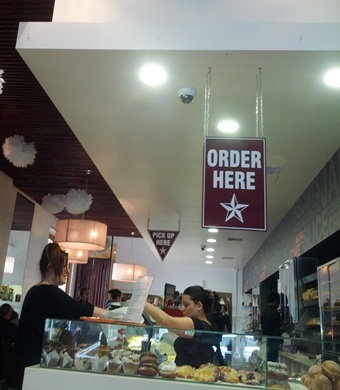 With a broad selection of sweet pastries, savoury pies, sandwiches and freshly ground espresso, the Alfa churns through a great deal of foot traffic as well as the seated multitude. With a number of staff kept constantly busy behind the counter and on the floor, the venue could be excused for extended intervals between ordering and dining. This was certainly not the case though with our breakfast out quicker than a fair-weather friend you have asked to help you move house. Although a bakehouse in name, it would appear that not all (if any) of the products are actually baked on the premises. When I enquired if the bread was baked in their own kitchen, I received a fairly vague answer. 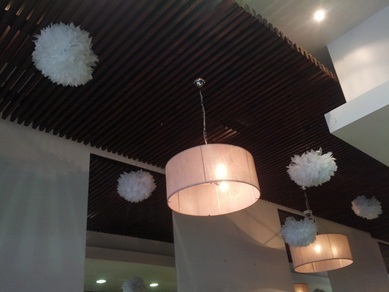 The hundreds-and-thousands encrusted chocolate-iced jam doughnuts were an indication that these weren't the freshest doughnuts in town and that at least some of Alfa's baking was outsourced. Whatever the case, one cannot argue with the results; our breakfasts, speedily delivered, were extremely tasty. 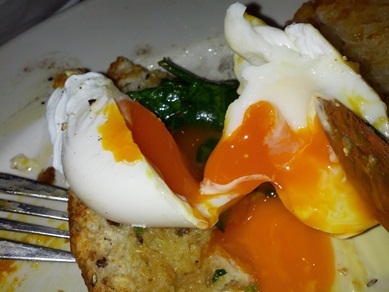 The eggs on my Florentine were perfectly poached, oozing yoke beautifully over the fresh multi-grain toast. 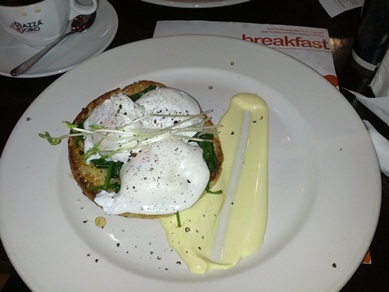 I was also happy to see the Hollandaise put to the side of the plate rather than saturating the other ingredients. This allows one to control the hollandaise distribution throughout the dining experience - and I tend to be minimalistic with its application. 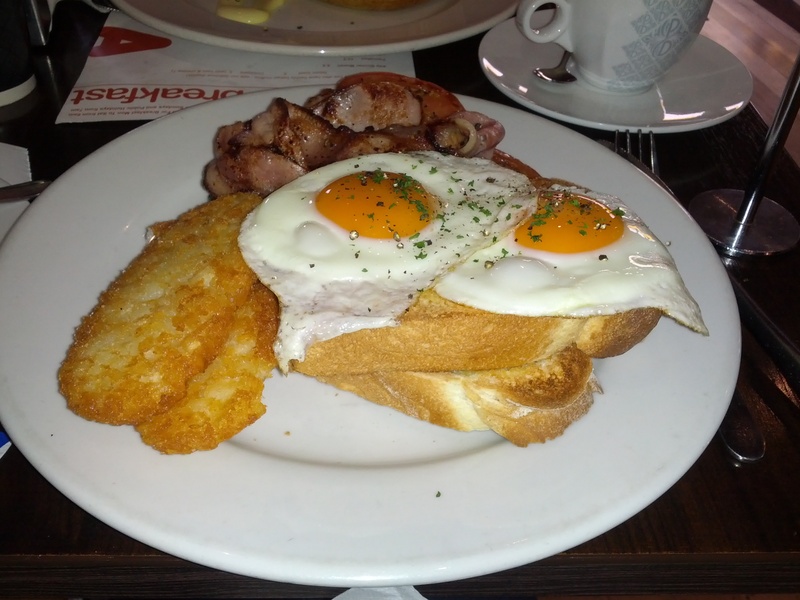 The King Alfa, their take on the big breakfast, was generous in size and flavour. The menu specifies fried eggs though I'm sure it would be no issue to order scrambled or poached. The bacon was crisp without a trace of grease complimented well by the sautéed mushrooms. Oregano had been used with the tomato, which combined with the freshly ground black pepper on offer was divine. Preventing the dish from being absolutely A-grade was the presence of the frozen variety of hash brown rather than a freshly prepared hash available at venues like the Odd Spot Café. Given the speed of service, the volume of traffic and the thrifty pricing at the Alfa however I can certainly forgive them this. The fact that diners pay before their meal arrives speeds up the turnover of tables and prevents the oft mood-killing, eye-widening revelation of the bill. 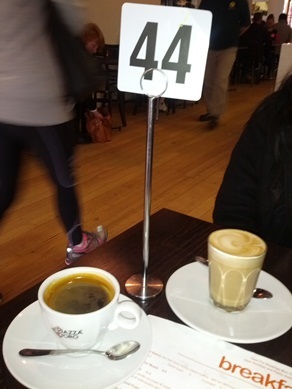 The strength of their coffee also ensures that diners don't hang around. With the caffeine coursing through my veins I was ready to power-walk out the door and take on my morning shopping at Footscray Market in record time. 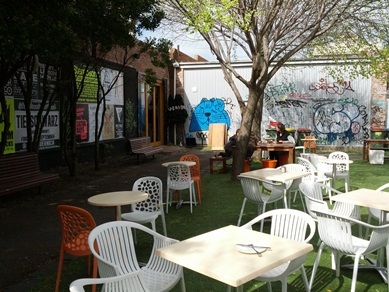 With dual frontage on to Anderson St and also facing Yarraville station the Alfa offers a great opportunity for al fresco dining, unfortunately thwarted on my last two visits due to a lack of cooperation from Melbourne's weather. Ah well, there's always next time. I'll be back - if only for the caffeine hit.